What is Your Primary Objective, Having Fun or Staying Safe? Your safety is paramount to us, and it is gratifying to see friends and families having fun and enjoying their time together, and not driving drunk after drinking sessions. Drunk driving should not be pardoned or condoned as it threatens the safety of innocent people. Make your reservation at www.saferides.org and get a memorable ride to proms or wedding, birthday parties, games, drinking-fest, concerts and other social events. SafeRides.org offers the best alternative to drunk driving by providing safe transport in vehicles that are fully licensed, inspected and insured. We do not take chances with your safety therefore you can rest assured to deal with profession and the least we can offer is sober rides from experienced drivers. Our approach in curbing drunken driving is making measurable impact. SafeRides.org got recognition from the State of New Jersey for their commendable services to the community. Do you need an inexpensive ride that will make a statement when you arrive at a social event? SafeRides.org unlike other transportation companies offers luxurious rides for any kind of event at below-market rates. We have partnered with local reputable limousine companies in order to offer you a variety of posh vehicles to choose from. And as a Charity Organisation, we pass the discounted rates directly to you so that rides can be affordable. Safe Rides Unlimited program helps establishments get a steady flow of business, and roads become safer as drunken drivers on the roads are reduced. The program also prevents drink driving consequences by preventing impaired persons from committing impaired driving offences. We physically help reduce alcohol-related accidents but most of all we help save lives. Do you want to just relax and enjoy the ride and the event without worrying about controlling the wheel? Reserve you ride at saferides.org and prevent precarious situations fuelled by alcohol impairment, distractions or fatigue. Are you in need of safe, on-time limo services? SafeRides.org offers special rates on luxurious transportation services that help you save up to 50% on some rides. The amazing rates not only apply to Limo but all vehicles including Party Buses, SUVs, Sedans, and Stretch SUVs among other posh rides. That sounds too amazing to be true, but it is what we are guaranteeing to offer you. Safe Rides Unlimited is a Charity Organisation that helps increase safety on our roads by preventing impaired driving. Our super luxurious rides make some people skeptical to make a reservation due to incredibly low rates offered. Skepticism can be caused by sheer paranoia and that is why we are transparent about the services we offer and our mission as a non-profit organisation. Our target is helping the community curb drunken driving that largely contributes to traffic-related accidents. We chose to use a fun and realistic strategy to fight drink driving and distracted driving by awarding our ridership with lavish comfort and additional perks when they use SafeRides.org services. Go to http://saferides.org/help.aspx for more information about the organisation including the booking process and cancellation policy. Our staff includes a team of professional individuals that will faithfully serve you and are ready to provide more clarification where clarity is due. Information is liberating and having sufficient information will certainly help ease your uncertainties. SafeRides.org serves New York, New Jersey, Philadelphia, Boston, Chicago, Los Angeles, Miami, and Jacksonville. The users’ honest and relatable positive reviews help appease the skeptical customers. So, if you are still doubtful of our services, you can look at our reviews on our site and social channels including the reviews from repeat customers to help wash away your worries. It is no surprise that when you try to offer first-rate services at unbelievably affordable rates, people tend to shy away. Being a nonprofit organization, SafeRides.org guarantees unrivaled services, prices and quality in transportation services. Our main challenge is getting people to believe that it’s not a scum and we offer services minding all the three factors to help minimize the rate of impaired drivers that get on the road. Having access to modern cars from our partner companies, we provide transportation in luxurious rides at the lowest rates in town. Our duty is to assure the skeptical customers of genuine, exclusive transportation services at low rates. Safe Rides Unlimited is a credible charity business offering services to prevent dangerous driving caused by alcohol-impairment. We provide our services to partygoers so as to prevent them from distracted driving and drunken driving. This is also a perfect way to dodge the stress that comes with traffic and packing. Our focus is to promote safety on the road hence the reason why we make the services affordable to everyone to prevent unwanted consequences of drunken driving. When you make reservations with us, you can be assured of VIP treatment, prompt pickups, excellent customer care, easy booking and you get to be served by friendly and courteous drivers. Our prices are second to none as you get to pay no tolls, taxes or surcharge. You get to enjoy up to 50% off the price of regular limo companies. We also throw in discount promotions regularly over our standard rates. SafeRides.org gives you an ironclad guarantee of quality services. Our drivers are insured, professional and experienced and are bound by code of ethics to assure you of sober transportation services. In addition to that, you get to choose to ride in top rated vehicles including Party buses, shuttles, Stretch SUVs, Sedan, Hummer limos, Escalade limos, Vans, charter buses and Mini buses. Do you have questions you need clarified on our charity or are you ready to make a reservations to avoid drink driving? Visit us at saferides.org or call us on 888-656-7233 for quotes and booking. You will certainly get invincible limo service rates for your trip package and also enjoy the additional perks that come with the services. Are you into happy endings? Ensure that all your celebrations end on that note by ensuring you, your family and friends get to their home safely. Fun and safety are the two main ingredients for memorable celebrations. Try making active decisions on safety during this summer period when parties are endless and alcohol drinking is on the rise. If you are the fun loving kind, SafeRides.org provides transportation services that contribute to the fun to help prevent you from driving drunk. We are here to ensure that you do not worry about how to get to the event and back home safely, think of the parking hassles, deal with traffic or moderate you’re drinking. This frees your hands and attention required to operate your vehicle and use it to connect with your friends and family riding along. This also allows you to let loose in some adult beverages and avoid drink-driving. SafeRides.org is devoted in offering exemplary transportation services to deter distracted and intoxicated driving. Better book us early enough to ensure that your ride is reserved for your social gathering on the weekends and holidays. The term ‘cheap is expensive’ does not apply to our services, we at SafeRides.org are assuring you that cheaper is better. We are a nonprofit organization hence get the luxurious rides from our partners in limo companies at a tax free rate and we pass the rates direct to you. The quality of services is not abridged by the fact that the rates are the lowest in the city, so you can rest assured to receive VIP treatment and exceptional customer service. Make a point of checking our social channels regularly to find out the latest promotions on top of our unbeatable rates. Visit us from your phone, tablet or computer for free quotes and instant bookings. A good ride goes a long way in making the fun just more intense. We have the collection of top-of-the-line cars in town that will help make the impression you are shooting for. Reserve a comfortable ride with SafeRides.org. It’s a fact that all vehicles are susceptible to accidents and the only thing that one can do is to entrust their safety to a sober driver who is able to make roadworthy decisions unlike an impaired driver. SafeRides.org is not all about providing luxurious rides but maximizing safety by providing sober rides from professional and experienced drivers. We as a Charity Organization is trying to minimize and prevent the risks related to drunk driving and buzzed driving. Call on SafeRides.org before your party or event. ‘It is better to be safe than sorry’ this is an underrated statement when it comes to drinking and driving issues that cause devastating consequences. Do not lie to yourself that buzzed driving is okay. A sober mind can get ahead of the situation once faced with a road challenge unlike a buzzed person who lacks preparedness to encounter any eventuality. There is no reduced risk in buzzed driving as impairment begins before reaching a legal limit which affects the driving skills and increases the chances of a mishap. Do not rely on your driving skills even when you take your alcoholic drink in moderation. The likelihood of buzzed drivers causing crashes is just as high as that caused by drunk driving. Driving while intoxicated comes with dire consequences and alcohol-related driving accidents can only be reduced by getting the drunk drivers off the road. Therefore mind your life and those of others by finding an alternative to drunk driving with SafeRides.org. Enjoy Safe Rides Unlimited trips in the Limos and other classy vehicles that are deemed to be available to the prosperous individuals or those with a higher placement of the community. We offer rides in these cool rides at incredibly low rates to ensure you get the best experience of commute time when attending an event or party. Avoid drunken driving by using SafeRides.org to attend those birthday parties, pre-drinking fest, pregame, and other social events. Do you want to enjoy an evening of fun and relaxation without having to worry about dealing with traffic, switching subway lines and parking? SafeRides.org provides you with elegant transportation services and unbeatable customer care that will also help you elude the perils of taxi services. If you want to let loose with some alcoholic drinks or go bar-hopping and check out new clubs, choose not to drive impaired or ride along an impaired driver and get a designated driver from Safe Rides Unlimited to avoid facing driving while intoxicated charges. As you well know that alcohol increases the risk of drivers causing accidents that kill or injure themselves and others, as it impairs your brain way before you reach the legal limit that result in poor reasoning and judgment that can lead to a dangerous turn of events. National statistics show that alcohol impairment to be a primary factor in traffic fatalities and you can help change this by making use of SafeRides.org services as well as recommending other to make reservations of a designated driving before heading to a party or social events being served alcoholic beverages. We are a charity organization so you can expect to get rides in modish vehicles at the lowest rates compared to other transportation companies. Drunken driving consequences affect individuals and the community in several ways as lives are lost, resources and time wasted and a lot more. It is utterly possible to prevent the gruesome consequences that come with drunk driving by reserving a ride with us and your will get an insured and reliable driver who will make your safety a priority. However short the distance to your place is, do not be tempted to get behind the wheel. Driving while drunk or distracted disables you to operate at your full capacity. SafeRides.Org gives you the chance to concentrate on the fun and takes charge of the driving that gets you to your event and back to your destination. Call on Safe Rides and be guaranteed to return home in a comfortable and safe manner. Are you and your friends planning to go to a birthday, wedding, bachelor/ bachelorette party or any other event serving alcoholic beverages, and no one among them accepts to be the designated driver? Make a reservation with Safe Rides to get a fancy ride to take you to your party and drop you back to your destination providing you with exemplary services worth every dime. Safe rides is a non-profit charity organization that offers the best transportation services in your town, but more so, provides you and your friends a safe trip with a sober and reliable driver. We are there to prevent you from making the mistake of driving while intoxicated. You need Safe Rides when you want to enjoy your night; visits to alcohol downtown without police invention. Don’t let that party you want to go to be your last. Be the smart one and ensure your safety by avoiding an alcohol impaired person from driving you. You will not only be helping save a life, but also saving your family, friends, coworkers, classmates among others the worry or any kind of impact that can be caused by a crash, deaths or injuries that could occur from impaired driving. Is it not a better option to have your fun and also get home safe? Safe Rides offers top of the line transportation services that include safe, convenient and affordable round-trips on a luxury safe ride, whether it is a party of one or of up to 55 passengers. We have a variety of rides to accommodate a small or large group. These are comfy rides that will take you to and from events ensuring a total splendid experience. With our friendly staff, we guarantee you will enjoy your ride. So, contact us and book an extravagant ride for you and your family or friends to that can’t miss event! The funny think about booze is that it makes you overconfident and once the alcohol is in your bloodstream, you lack full control hence its unwise to assume you are good to drive. If you plan to engage in merriment that involves drinking alcohol, book a ride at saferides.org prior to the party or night out for you and your friends. Safe Rides Unlimited is dedicated to ensuring your safety on the roads with big posh and affordable rides before and after a night of fun. You can also play a significant part in helping cut alcohol related casualties and accidents by rescuing your friends from making poor personal choices such as driving while drunk. We will take the responsibility of being your designated driver and prevent impaired driving incidents that can cost the lives of the driver, the passengers in that car and other road users. It is hard to know a person’s drink driving limit as it varies from person to person and also it is impossible to judge by the number of drinks taken. Drinking kills driving skills, therefore you can’t guarantee that you will hold your drink and manage to drive. Why risk getting a hefty fine, a criminal record, prison sentence and driving ban. These drunken driving consequences tend to put a strain on your lifestyle, your finances and relationships. Do not be tempted to drive after having one for the road plan how to your destination without driving. SafeRides.org offers you the alternative way to get home so as to help reduce the number of deaths and serious injuries on roads. Help support the drunk driving prevention works by trying to make it your personal responsibility to prevent your intoxicated friends from making a questionable personal choice that will do harm to themselves and others. When driving under the influence of alcohol you cannot guarantee that nothing untoward will happen, and bad consequences for bad actions are inevitable. Therefore, do not fail to act otherwise you might live to regret. Safe Rides Unlimited is a NPO that has made its business philosophy to solely focus on going above and beyond to offer their customers unmatched transportation services to prevent reckless behavior on the roads and impaired driving liabilities. World Health Organization has identified drinking and driving as one of the major risk factors contributing to road traffic mortality, and these factors have become their focus in the aim of improving road safety. Safe Rides Unlimited sole purpose is to prevent and significantly reduce drunk and distracted driving and it is making far reaching significant changes by providing transportation to prevent potential drunk drivers from getting on the road. 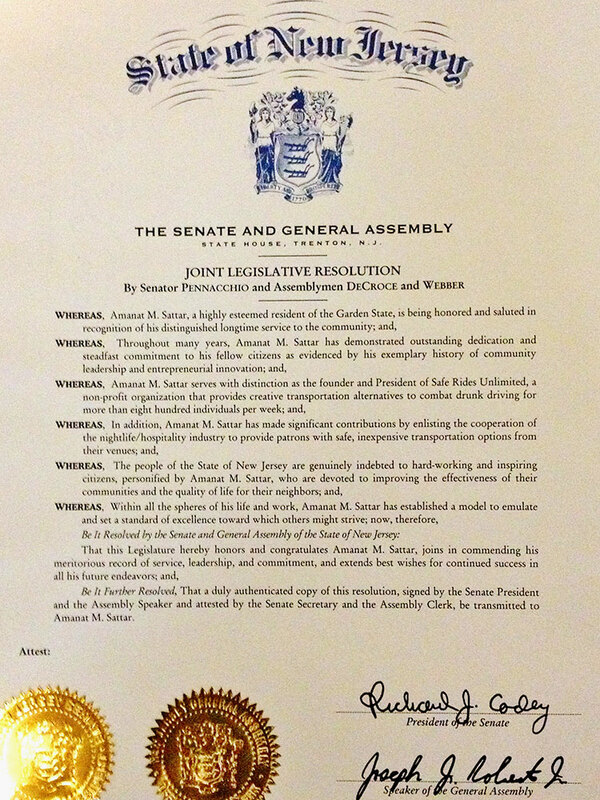 Started by Mohib Sattar Amanat in 2004, Safe Rides has since been recognized and awarded the Joint Legislative Resolution by New Jersey Senate and General Assembly for a commendable record of service and commitment. The charity used to save more than 800 lives in a week in New Jersey through their transportation services that aim at minimizing drunk driving. The numbers of saved lives have multiplied as their services have expanded to other cities including New York, Chicago, Boston, Los Angeles, Philadelphia, Fort Lauderdale and Miami. Safe Rides also broke a record for physically preventing over 4000 people from driving while drunk in one night. Safe Rides has contributed a lot to New Jersey and other cities by offering party lovers unmatched and realistic options that keeps them safe while not interfering with their fun. They participate as affiliate of the hospitality and transportation industry. Safe Rides have been incentivizing people including college students to use their luxury transportation services. They provide you with first-class services and affordable rides in big luxurious cars, and have recently reduced the per person rates again with a 5% off promotion. Visit SafeRides.org/ and book a ride to your event and help avoid drunken driving incidents. SafeRides.org is a recognized Charity Organization that provides safe and reliable transportation services in several big cities including New York, New Jersey, Philadelphia, Boston, Miami, Los Angeles, Chicago and Fort Lauderdale in the aim of preventing or minimizing alcohol-impaired and distracted driving. They provide their services to ridership going to parties and events, and their comfortable rides, timely and reasonably priced services, courteous drivers, and easy booking process gets their ridership coming back. The Non-Profit business has partnered with reliable transportation companies thus giving their customers a chance to pick their ride from the best selection of big, luxurious vehicles available that include Limos, Stretch SUVs, Party Buses, Vans and Charter buses that accommodate larger groups of individuals. These Safe Rides Unlimited’s modern and top quality rides have additional accessories and facilities to provide lavish comfort. They provide exceptional services to help prevent as many people as possible from driving under the influence (DUI). Customers of SafeRides.org get to spend less on their transport as there are no tolls, taxes or any surcharge paid which makes their limo services invincible and available at half price of regular limo companies. Their ridership also get to enjoy a luxurious trip that includes great customer service, VIP treatment when they reach their venues, free admissions without waiting on line into Safe Rides’ program member clubs and bars. Customers avoid distracted driving by using SafeRides.org for they can relax and enjoy every moment of the ride with, and use the commute time to bond. All their vehicles are run by professional, experienced and well-trained chauffeurs that guarantee a sober ride and can rely on for prompt pickups. Their superb vehicles offer the finest alternative to drink driving and methods for a smart and secure trip making their services highly recommended for friends and families planning to engage social drinking.